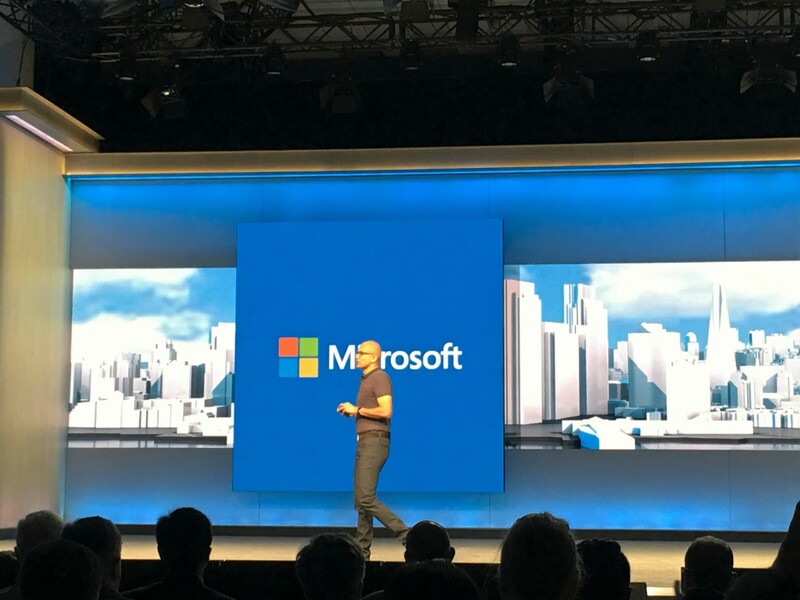 Microsoft BUILD is the company’s annual developer conference where they communicate their latest strategies and deliverables to developers and launch many new innovations. BUILD is extremely developer- focused and is intended to inform current Microsoft developers as well as recruit more developers to develop for Microsoft platforms. I attended BUILD the week before last held in San Francisco. Microsoft hasn’t been successful in the smartphone OS or small tablet market, although they have seen big growth in Windows convertibles. Currently, iOS has 1 billion users while Android has 2.3 billion and Microsoft 10 has 270 million users across all devices and an installed base of 1.5 billion total Windows users. Microsoft has traditionally struggled in the mobile OS market, ever since the days of Windows Mobile. Back then, Microsoft had virtually no competitors and most users just expected embedded Windows (Windows CE) to behave just like Windows XP, even though the experience wasn’t optimal. Once operating systems like Symbian, iOS and Android started to take off, Windows Mobile dwindled and lost the smartphone productivity market to the likes of Blackberry (then Research in Motion) and Apple. Microsoft has tried hard to make Windows a relevant smartphone platform but many long-tail consumer developers simply have had little interest to develop for the platform. As a result of this, Microsoft is no longer banking on becoming relevant in mobile OS and driving revenue in mobility through a mobile OS after having tried multiple times. I am by no means saying Microsoft has given up on a smartphone OS. 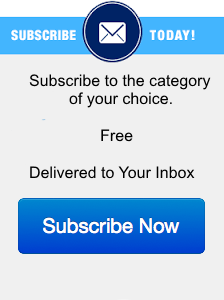 They haven’t, they’re just being pragmatic. 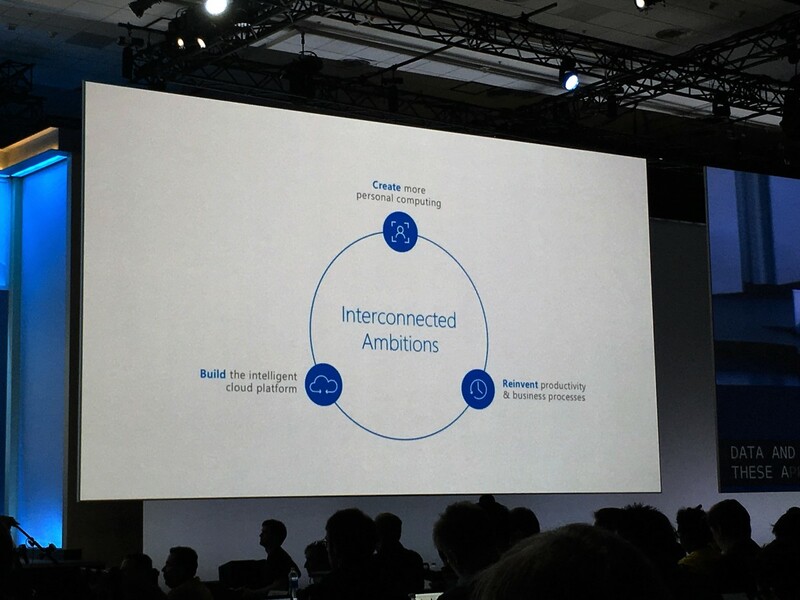 If Microsoft can get mobile developers to use their tools (Xamarin/Visual Studio/Bridges), data services like Azure, apps like Office and Cortana as well as bots, then Microsoft will have surrounded iOS and Android and gone a long way towards a form of mobile relevance and success. I attended Microsoft BUILD where the company made their case to developers that they should use their tools, services, apps and bots in their products. The world today is a Windows, iOS and Android and all other operating systems are currently simply irrelevant or niche to consumers and enterprises on the device side. Microsoft’s future vision also depends on the assumption that the world will stay a Windows, iOS and Android future. 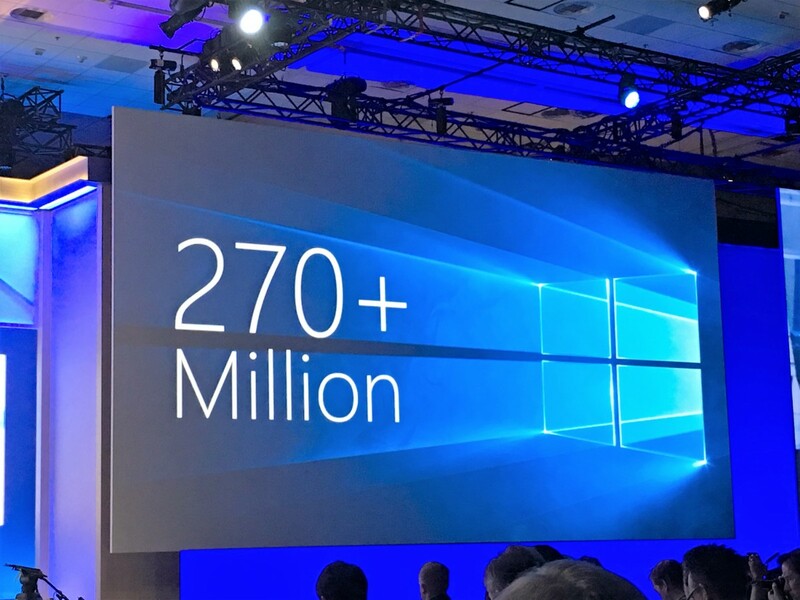 Right now, Android and iOS are gigantic in terms of install base, but Microsoft expects Windows 10 to grow from 270 million users today to 1 billion by 2018. This number takes into account many Windows 7 upgrading as well as all new PCs shipping with Windows 10 as well as the entire XBOX One install base which now runs on Windows 10. Here is a rough forecast on how I think they could get there. To enhance productivity, development tools that generate native iOS, Android and Windows binaries are very important to the success of Microsoft strategy. The thesis is that by making development environments for all three platforms easier means that developers are more likely to use Microsoft’s tools and those tools enable developers to make Windows apps more easily. Ease of use is one of the biggest factors for developers when it comes to developing for a platform after the TAM which is in many cases the most important factor. 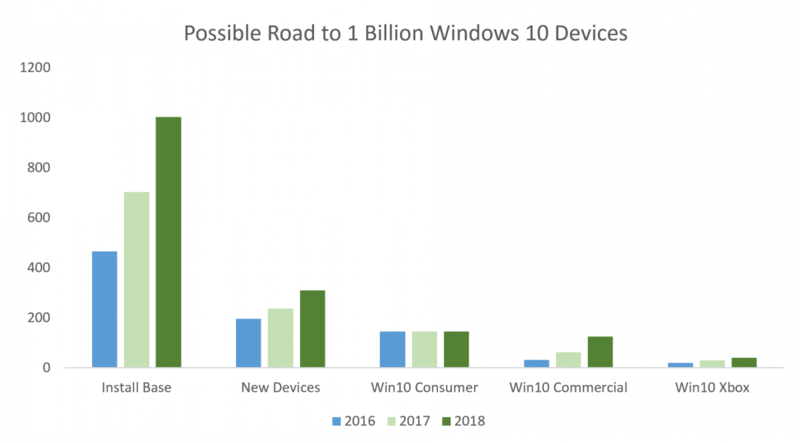 By growing the Windows 10 install base and having all devices on the same version of Windows, developers would be inherently more attracted to the platform. That’s the thesis. Microsoft already has a lot of attractive applications that users may want to consider that are related but independent of Windows itself. These applications already run on iOS, Windows 10 and Android and in many cases are very popular with users outside of the Windows operating system. Some strong examples are Skype, Office 365, OneDrive and Cortana mobile apps. Currently, Office gets a lot of use on MacOS and Android and Office is generally accepted as the standard productivity suite across all platforms. The experience is mostlyconsistent across all platforms and travels with users anywhere they go on any device they pick up. In addition to the user base and applications, Microsoft has Xamarin and Visual Studio which should make the development of native applications a smoother and more productive process and one that includes Windows into the fold. Microsoft’s recent acquisition, Xamarin, allows developers to use C# base application code and when used with Visual Studio can create native iOS, Android and Windows 10 Unified Windows Platform (UWP) apps. Xamarin is free now and offers a free Visual Studio version as well. It also offers developers via the Xamarin Test Cloud to test their applications on over 2,000 real devices. Xamarin’s Test Cloud enables developers to test applications on multiple operating systems and to keep most of their development and testing on one platform, if they choose. Microsoft’s strongest play for mobile relevance has a lot to do with the services that their applications are based on. Some of these services are productivity-based and others are designed to give developers more usability features to improve the overall user experience. For example, developers can utilize Cortana’s services in order to add cognitive services to their own applications and services to provide better contextual understanding of a user’s needs. Skype’s SDK allows developers to use the SDK to enhance their applications like MDLIVE’s telehealth services which help connect patients with doctors via Skype’s services. Microsoft is also harnessing the power of Office’s 365 services with the Microsoft Graph API and Office add-ins. Developers can create mobile applications that use Microsoft’s Graph API like DocuSign who uses Office 365’s services to improve the delivery of their own documents between customers. Office add-ins are also an opportunity for developers to create features as add-ins are already supported in Office for Windows, Office for Web, Office for iOS on iPad and Office 2016 for Mac. There are already some extremely useful add-ins like Boomerang which allows workers to schedule and track emails inside of Outlook as well as many other added functionalities on top of Outlook. Also, Starbucks showed off an add-in that schedules coffee meetings in Outlook, opening the door to companies looking to get in on the add-in action and help drive business inside of Microsoft’s own applications. Microsoft also introduced a whole host of new bots that are also powered by Microsoft’s own Azure cloud services. These bots are designed to fulfill a whole host of functionalities and can be used by companies as part of applications to help reduce customer service costs as well as create instantaneous interactions with their customers. These bots are also supposed to be much smarter compared to the bots of yesteryear thanks to Microsoft’s own artificial intelligence and cognitive capabilities with Cortana. The means that Cortana can be used to introduce different companies’ bots to make user interactions smoother and more natural than using a simple webpage. 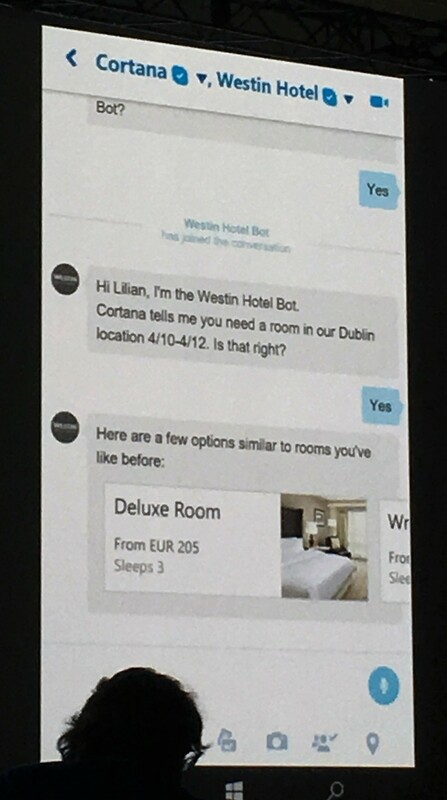 A great example of this is while chatting with someone in Skype, Cortana can infer that you plan on visiting someone and can introduce a hotel bot like Westin’s hotel bot that can help you book a hotel for the appropriate nights and put them into your calendar automatically thanks to the context from Cortana. This marks an improvement in speed of getting things done while also making experiences more interactive and native to the application. Microsoft’s BUILD conference this year really did its best to make the case to developers that they should be looking at Microsoft’s many services and applications to develop their own apps. While I consider this a mobile plan B, right now, this is really what Microsoft must do to be relevant in the mobile market regardless of their mobile market share. If developers are building their applications for all operating systems using Microsoft’s tools and incorporating Microsoft’s own services and bots, they ultimately achieve what they appear to be looking for. Google doesn’t make any money off the billions of devices running the Android operating system, they make money off the services and advertising. Microsoft has the best opportunity for growth with increased mobile relevance and they appear to be doing exactly that by introducing all of these new tools and services. I will be writing more about this over the coming weeks and months, outlining their strengths, weaknesses, opportunities and threats of this strategy.